We've talked about the Future of Music Coalition's excellent Artist Revenue Streams project for a while now, and over the last few months they've been releasing more and more results from the project. At some point in the future I'll have to dig more into some of the earlier results, but I thought it was interesting that at SXSW they released some specific financial case studies on five (anonymous) musicians in particular, digging with great detail into how they make money. I found the "indie rock composer-performer" case study particularly interesting, given some of the regular debates around here. While this is just one performer, and clearly not a "representative sample" or even a composite sample of how such musicians make money, there's still plenty to be learned from the report. What comes across is that it certainly takes work, but an indie artist such as this guy has been able to increase both his earnings and his profit over the last four years. Of course, that doesn't mean that each of his multiple revenue streams was increasing, but that he was continually altering his approach to maximize his own revenue and net income. For example, after a few years of relying heavily on income from one band that he was in (and he's in a few), he's been able to successfully shift to being a solo artist. Of course, the revenue shift there is pretty clear. 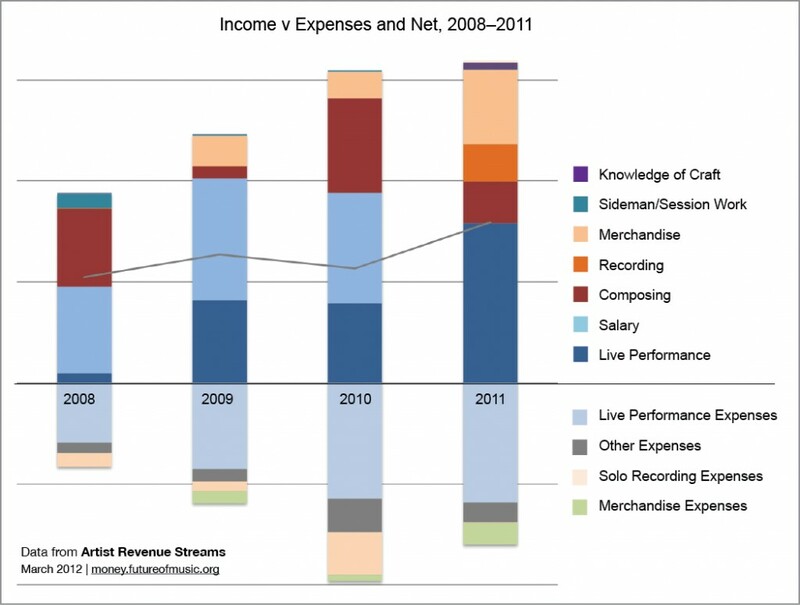 While he made a salary from the previous band, as a solo artist, a large chunk of his revenue now comes from live performances: One thing that struck me as interesting, and which corroborates similar stories I've been hearing from other artists, is that while touring can be tough, the ability to "tour smarter" these days means that it can be profitable. Frequently, critics insist that touring can only be profitable for the largest bands, but we keep hearing otherwise, and this report suggests something similar. Yes, there is significant expense involved in touring, but it can be done well and profitably. Either way, the entire case study is worth a read. I think these days people are more inclined to go with more fuel efficient vehicles than with diesel cars.